Can You Afford This Dreaded Retirement Expense? Long-Term Care: How Will You Afford This Dreaded Retirement Expense? 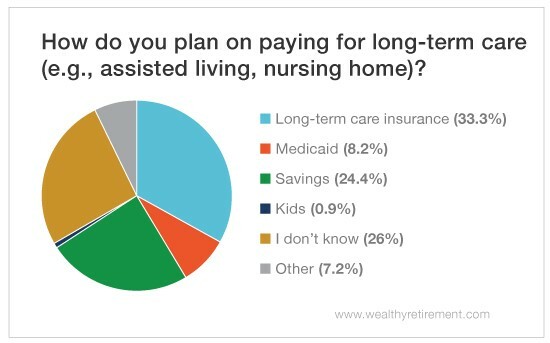 Home TrendsThe Stat Sheet	Can You Afford This Dreaded Retirement Expense? If you don’t know how to pay for your aging needs, then who will? Last week we asked readers about the “right” time to enter an assisted living facility or nursing home. This week we asked how you’re planning to pay for it. Living in an “old folks” home isn’t anybody’s dream retirement destination. But unfortunately, that’s where some of us will spend our final years. That stay will cost you. Professional care as we age doesn’t come cheap. It can easily become your biggest retirement expense. And paying for that necessary care is a big reason retirees outlive their savings. Shockingly, our recent survey found that more than a quarter of Wealthy Retirement readers don’t know how they’re going to fund their nursing home or assisted living needs. They don’t have a plan. Here’s a scary statistic… If you’re 65 years old today, there’s a 70% chance that you’ll need some type of long-term care (LTC) during your lifetime. That includes in-home help, assisted living and nursing homes. And about 25% of older adults will require nursing home care at some point in their lives. Women typically require more care (which isn’t surprising since we tend to live longer). On average, women will stay in a nursing home for 2.6 years, while men will stay for 2.3 years. Costs vary by state, but the annual costs of nursing home care can range from $82,128 to $92,376. So all in all, an average nursing home stay will cost between $189,000 and $260,000 per person. That’s more than the list price of the average starter home. If you haven’t thought about your LTC plan yet, listen up. Contrary to popular belief or maybe wishful thinking, you need one. Medicare may cover short-term care in a skilled nursing facility after a hospital stay. But it doesn’t cover custodial care, like help with bathing or dressing. That’s what most of nursing home care is. Medicaid can help pay for nursing home care, but your income must be low to qualify. And you’ll have to spend nearly all of your assets before Medicaid coverage kicks in. To qualify for Medicaid, you typically need to have less than $2,000 in assets. And if you think you’ll need Medicaid, you may want to make sure you choose a facility that accepts it. Purchasing LTC insurance is another option. Depending on the policy, this type of insurance policy may include many different types of LTC, but coverage varies widely. Some policies cover only nursing home care, while others may cover services like adult day care, assisted living and in-home care. On Monday, The Oxford Club’s Bond Strategist Steve McDonald shared a story about LTC insurance and “how it may not be all it’s cracked up to be.” After years of paying expensive premiums, you may find it’s difficult to qualify to claim the benefits. And you could wind up paying out of pocket for the help the policy should have covered. Interestingly, while just 11% of baby boomers have LTC insurance, one-third of our respondents said they plan to use it to pay for their LTC needs. You may qualify for discounted LTC insurance if you’re an active or retired federal employee or a member of the uniformed services. Here’s how to find out if you’re eligible. There are ways to lower your costs too. Where you live can greatly affect your nursing home costs. For example, a private nursing home room costs $12,471 a month in Massachusetts but costs $6,464 in Alabama. Relocating to a cheaper state could shave thousands of dollars off your nursing home bill. While you might not need LTC insurance, you definitely need a plan in place to pay for it. The price of care isn’t getting any cheaper. We’re living longer, and those extra years of life are costing us a whole lot more.